SPX: Right after the open the SPX made a new high at 1120 near the 50% retracement level - ...well... and that's everything one can tell about today's market action. As mentioned in the update right after the open, micro wave  topped at 1120. From there the market started its correction. 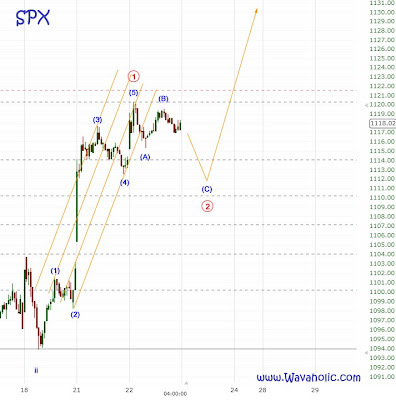 So far, we've seen a 5 point drop labeled as wave (A) followed by a rally in the afternoon labeled as wave (B). Tomorrow I expect wave (C) to unfold and end around the wave (4) low to complete micro wave . After that, the rally should resume and continue to make new highs till the end of the year.